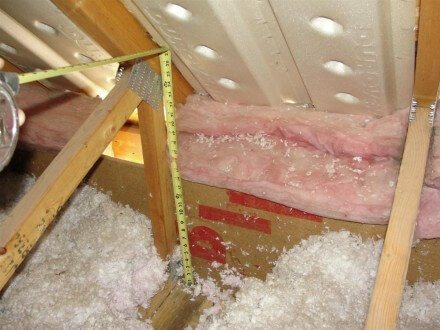 When we inspect houses, we frequently make recommendations for more insulation in the attic, but one challenging place to properly insulate on old houses is the eaves. The edges of attics, referred to as the ‘eaves’, rarely have enough insulation on old houses. The problem is that houses never used to be constructed in a way that allowed for enough room for proper insulation at this location. The photo below could be any old rambler in Minnesota – almost all of them look like this. Today, homes are built with raised-heel trusses, or ‘energy trusses’. This creates a bunch of extra room at the eaves just so the proper amount of insulation can be added. I pulled the insulation away at the eave in the photo below to show this. 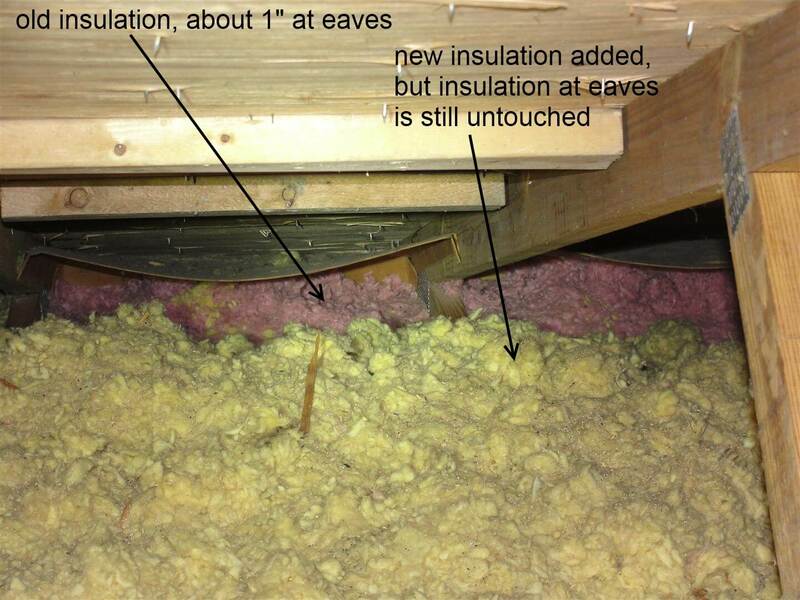 A minimal amount of insulation at the eaves results in energy loss, which is unfortunate, but not a major concern. Usually. The time that this lack of insulation at the eaves starts to become a bigger concern is when the home has ice dams. Insufficient insulation at the eaves is a common contributor to ice dams, and there’s no simple solution for this. 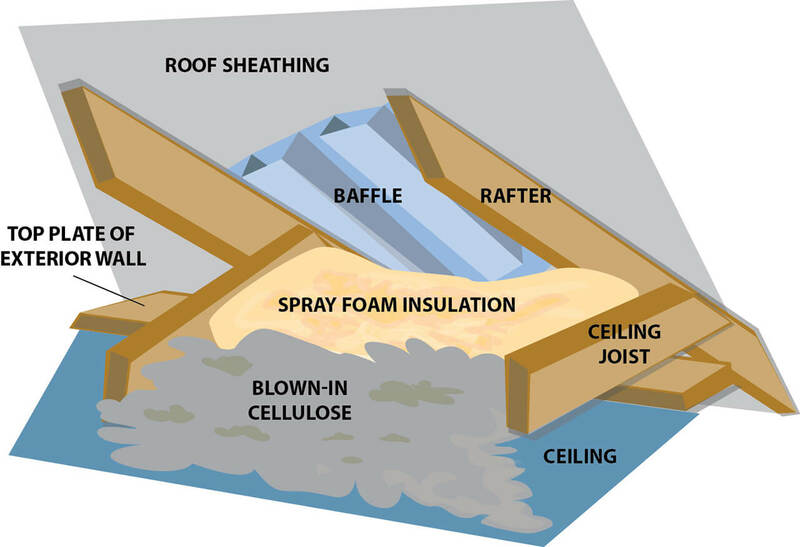 The best approach in these situations is to use an insulation with a higher R-value per inch – specifically, closed-cell spray foam insulation. It’s not necessary to have the entire attic lid insulated with spray foam, but having spray-foam insulation installed at the eaves is a great way to help compensate for the lack of space at these locations. The illustration below, provided by the Minnesota Department of Commerce, Division of Energy Resources, shows what this method looks like. The only downside to having this type of insulation installed is that it’s more expensive than other types of insulation, and the work should be performed by an experienced spray-foam insulation installer. It’s not a DIY project. In renovating an old house, is spray foam insulation the way to go? Tony – it’s not perfect for every application, but yes. It’s probably the way to go. Closed-cell foam outperforms everything else. hi Reuben,is there a particular spray foam insulation that works best or is it only early days with a number coming to market? Hi Darren, I really don’t know enough about the different brands to have any preference. 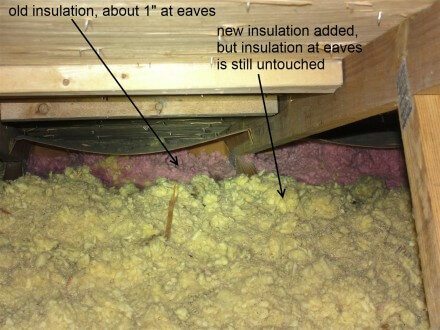 The type of insulation that should be used at the eaves would be closed-cell foam, aka 2 lb foam. Many times over the years I’ve heard and read that it would cause ice dams if there WAS insulation in the eaves because it didn’t keep the roof above it cold enough. But it seems you’re saying the opposite. The way I’ve understood it is that there should be vents in the eaves to bring air into the attic, and ridge vents or other high vents to allow air out of the attic,and that the baffles were placed where there were vents in the eaves,allowing the air (cold in the wintertime,obviously) to flow against the interior of the roof to above the insulation. If that’s not right, then what are the baffles in your picture doing? Are they not aligning with eave vents? Thanks for any follow up information! I’m also interested in the best way to insulate attics in warmer temperatures. One major contributor to ice dams is warm roof decking. If there isn’t any insulation at the eave, the roof decking will warm up. Ventilation at the eave will help to reduce the effects of insufficient insulation, but is not a good alternative to proper insulation. In other words, insulation at the eaves will definitely not cause ice dams. There should be insulation AND ventilation at the eaves.